Our team is based out of Rochester Institute of Technology in Rochster, NY, although two of our members come from other colleges across the country. Elizabeth Mihalo was the source for the monkey voices. Chad Austin and his team for the great LGPL'd Audiere audio library. The installer program is Copyright (C) 1997-2002 Jordan Russell. All rights reserved. http://www.innosetup.com/. Thanks for the support and encouragement from our professors at RIT! Jessica Bayliss for helping find team members and providing a lab for us. Portions of code Winnebeck, Mowry, and Hilliker developed in Andy Phelps's 2D and 3D DirectX graphics courses was used in the game. The skeletal animation system Jason Winnebeck developed for Joe Geigel's Computer Animation: Algorithms and Techniques class was used in the game. The cel-shader developed by Jason Winnebeck for Nan Schaller's Computer Graphics 2 class was used in the game. The 3D level renderer developed by Jon Hilliker for Andy Phelps's 3D gaming course was used in the game. 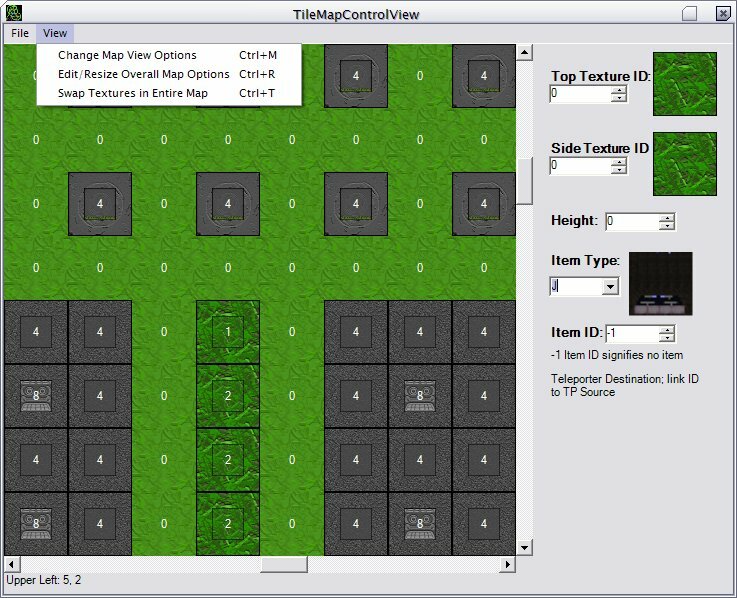 The Level Editor was developed by Peter Mowry as an assignment for Shreiner's Introduction to C# and .NET Programming. Thanks to the Electronic Gaming Society for hosting the development CVS and files server. Mega Monkey Mayhem is a fast-paced monkey bomb battle. Scour the battlefield for powerups to improve your monkey's abilities and arsenal. 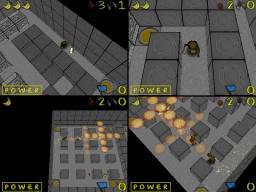 Attack other players by throwing bombs and catching them with the explosions. Use the terrain to your advantage to strike at enemies below. But watch out for contagious jungle viruses that make your monkey sick! 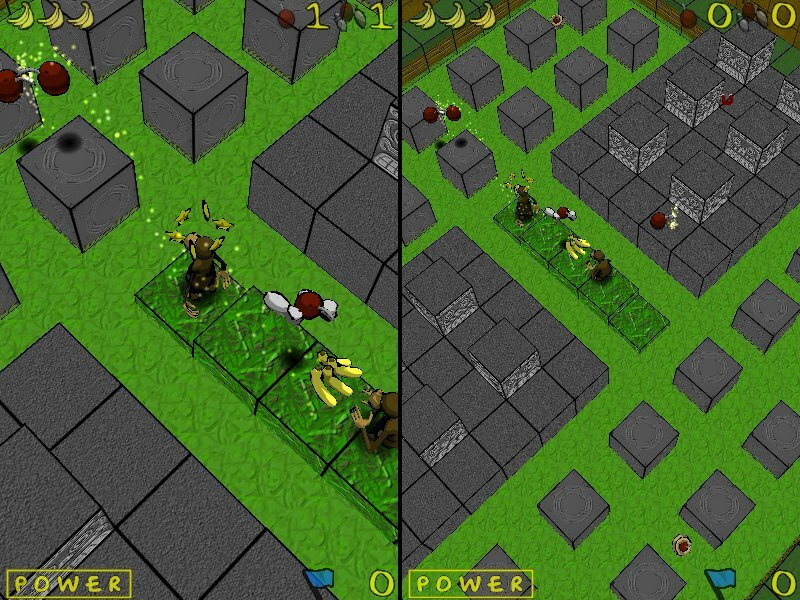 Mega Monkey Mayhem uses a 3D engine capable of rendering cel-shaded objects to give the game a distinct theme and feel. 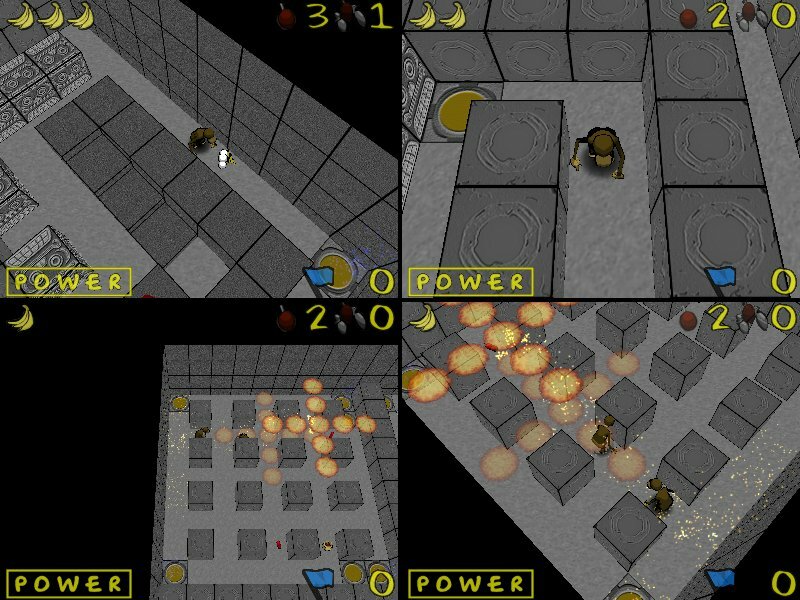 A few parts of the game were developed as class assignments but most of the work was done on our own so we could enter the game into the IGF 2004 Games Festival Student Showcase. Cel-shaded characters and bright, colorful stages set a cartoonish theme. Focused more on fun and comedy than violence, blood, and gore. Fun music soundtrack and sound effects. Supports up to 4 players, using a combonation of keyboards and up to 4 joysticks. A graphical user interface for configuring player controls and key settings. 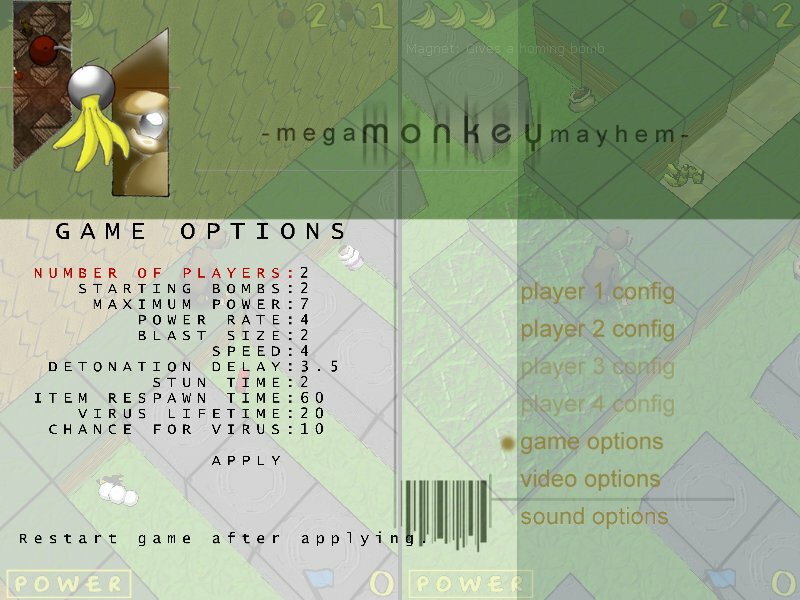 The GUI also allows players to change the gameplay, to customize gameplay settings such as monkey speed and bomb fuse time, allowing the player to greatly alter the style of resulting play. An install and uninstall feature that allows the game to be completely uninstalled without leaving any clutter on your system. A map editor to create your own maps. Twenty years ago, a starship carrying a load of munitions to the front lines of some long forgotten inter-galactic war, crashed into the quiet planet of Kurtal, scattering its cargo across the great jungle of Gruu'man. The population of this jungle was mostly a happy race of monkeys until the day of the crash. On that day, the great Monkey King Pomaloopay, well known for his smooth hair and dark teeth, was perusing his jungle when one of the bombs landed upon him, killing him and destroying his favourite tree. Shortly after, the monkeys began to point fingers and throw doody, as the beach dwellers blamed the jungle monkeys for the incident, who in turn blamed the river monkeys. Soon, the whole jungle was set aflame as the monkeys learned to use the bomb generators that were scattered throughout Gruu'man. Now, 20 years later, you are one of the mighty monkey warriors, set upon the jungle battlefields to protect your village. Fight for the sake of your neighbors and your children! Fight for your bananas! In Mega Monkey Mayhem, the goal of the game is the total annihilation of your opponents. To do this you have two main weapons: Bombs and Homing Bombs. Bombs are held by the monkeys, and can be thrown some distance from the monkey. You can increase this distance by holding down the Throw Bomb button longer, until your power bar fills. Bombs can be used to block the path of your opponents. Bombs will only explode for a certain number of tiles in a plus shape. Dynamite powerups increase this range, and bomb bags increase the number of bombs you can have on the board at any given time. Homing bombs are like bombs, except that they can sense the nearest monkey in front of them and follow him for some time, then if they touch the target, they will explode. Homing bombs are very volatile and will explode on contact with any object, even the player who threw it, and they can sometimes explode when falling off ledges. If a monkey is hit with a bomb, the bomb will bounce off the monkey and he will be stunned for a few seconds. You can use this time to plant additional bombs to block the monkey. Some levels feature teleporter devices that fell from the munitions starship as it was crashing. The monkeys never figured out how to use the teleporters, and they were never set properly. So in their current state they only teleport monkeys that step into the teleporter to a nearby location. You can tell a teleporter by the teleporter pad and the blue particles that it generates. 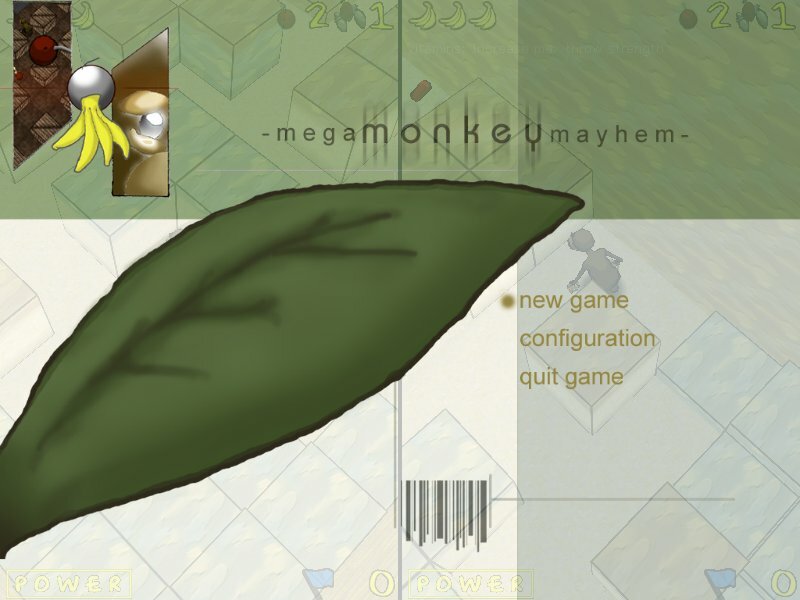 In Mega Monkey Mayhem, there are several items available for the monkeys to collect and exploit. However, there's a danger to picking up items. You may catch a virus that will reduce your abilities significantly for a short time. These viruses are contagious; you can pass a virus to another player by running into them. Screenshots from the current version of the Mega Monkey Mayhem game. Click on the image to view a larger sized image. The game right after loading it up. The game options configuration screen. Two player match on battlegrounds. The left player is currently stunned from being hit on the head with a bomb and stars are circling his head. Four player mega melee in Cargo Bay. The Cargo Bay map is split into 4 sections with teleporters to travel between them. The map editor in action. These requirements are very strictly required, or the game will not run. Almost all computers now fit these requirements, so if you don't understand what these terms mean, just try the game as it runs well on a wide variety of systems made in the last few years. Yourself and at least one other person to play the game with ;). The map editor requires the Microsoft .NET Framework 1.1 or higher (use Windows Update to get it). If you get missing "d3d8.dll" errors, you need to install DirectX from Microsoft's web site. If you got a "Could not create device" error, your video card is likely very old and is not supported by the game. Contact me and let me know what hardware you have and I will try to help. A missing DLL error when trying the editor usually means you need to install the .NET framework 1.1. Run IE, and pick Tools -> Windows Update to get it. Geforce 2 or equivalent video card or better with 32 megs of video RAM. Geforce 4 Ti (not MX) or equivalent ATI or Matrox video card or better. If you have an older video card such as a Geforce 2 or Voodoo 3, it is much more important to have a faster CPU, since features are emulated on the CPU. I have seem some systems with some very low performace video cards work well if the system has 2ghz+ CPU. If you have a recent video card supporting vertex shaders such as Geforce 3 or higher, CPU is not as important as having a good video card. 16-bit 3dfx users: M3 will not work in windowed mode unless your desktop is set to 16 bits. By default, M3 starts in 640x480x16, but almost all systems can handle resolutions above 640x480 and in 32 bit without a significant loss in framerate. If you have an "optimal" system above, the reccomended resolution is 1600x1200x32bit if you have a 128meg or more card. Downloading the game requires that you agree to the license (also shown in the installer). Just download this executable, and run it to start the installation. It will create an entry in your programs menu and optionally an icon on your desktop. 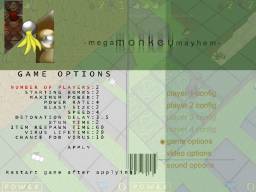 Download Mega Monkey Mayhem version 1.0, November 11, 2003, size 7,008,256 bytes. Some materials we developed for the IGF submission form, that might be an interesting read. Note that these apply to the original version of the game that we submitted to the IGF contest. Why and how our game is innovative. What do we feel was complete, and what needs improvement? This section contains elements specific to the course for which we are developing Mega Monkey Mayhem.